Made in the USA - 600 Denier Polyester vinyl Zippered Golf Accessory Bag with black nylon zipper, stitching, snap hook, and seamless bottom. - 5"W x 7". 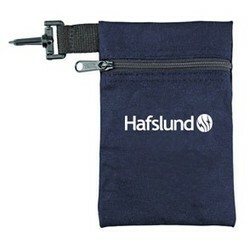 Great for golf items or personal possessions. Clips to almost anything with the sewn on convenient clip. This bag is perfect for easy accessibility on the go. add $.30(g) running charge and $50(g) setup per color & 5 days. Maximum number of imprint colors- 600 Denier is 3 colors. Setup Charges apply to repeats as well. w3-1/2” x 4”; Fine lines will not print well due to texture of this material.